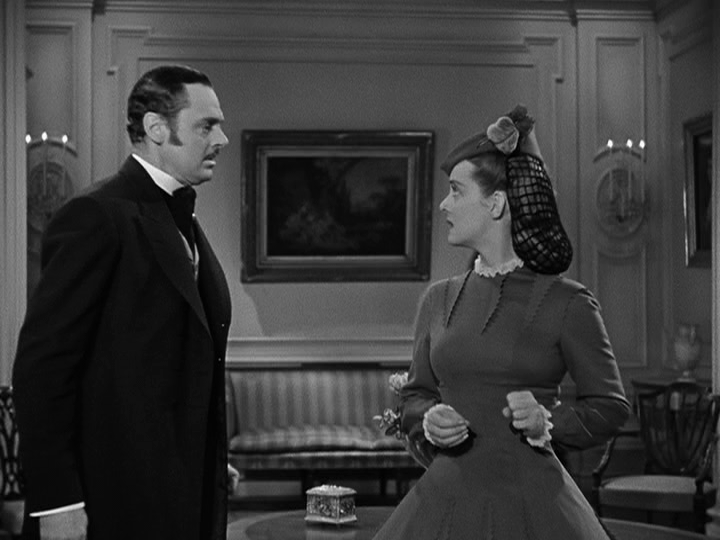 When her cousin (Miriam Hopkins) marries a wealthy man (James Stephenson) rather than waiting for her fiance (George Brent) to return home, Charlotte (Bette Davis) — who’s loved Brent all her life — has an affair with him before he heads to the Civil War and is killed. 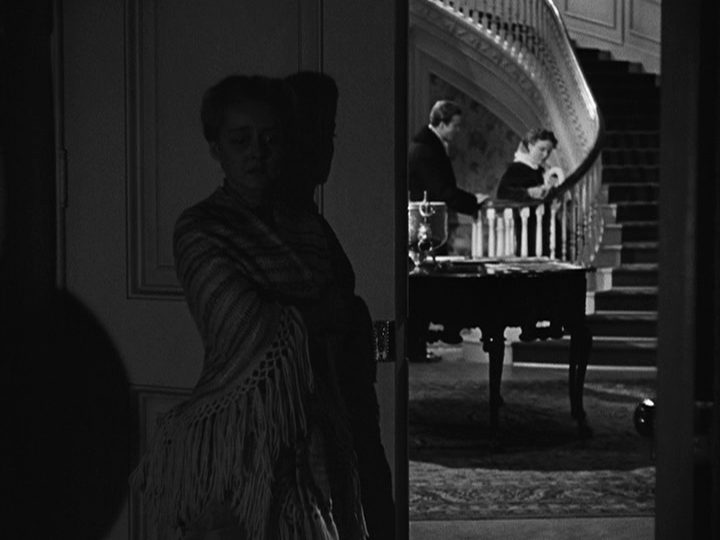 Davis secretly gives birth to a girl named Tina (Marlene Burnett), whose identity she conceals by managing an orphanage. When Hopkins learns the truth about Tina, she prevents Davis from marriage with her husband’s brother (Jerome Cowan), and convinces Davis to let her adopt the girl — but soon Davis’s resentment begins to build, especially as grown Tina (Jane Bryan) cares more for Hopkins than her strict “Aunt Charlotte”. Peary writes that this “standard Victorian soap opera about unrequited love, sexual frustration, female rivalry, class obligations, and other sacrifices” benefits — “it goes without saying” — “from the casting of the two classy stars”. He notes that while he wishes “the two would have at least one hysterical screaming session” — and that “Davis in particular is just too restrained” — it’s fun watching Davis “young, in hoop dress and blond curls, and old in her severe old-maid hairstyle”. (I’m not quite sure why he refers to this as fun, other than comparing how Davis aged in real life with how she’s “cinemagically” aged here.) 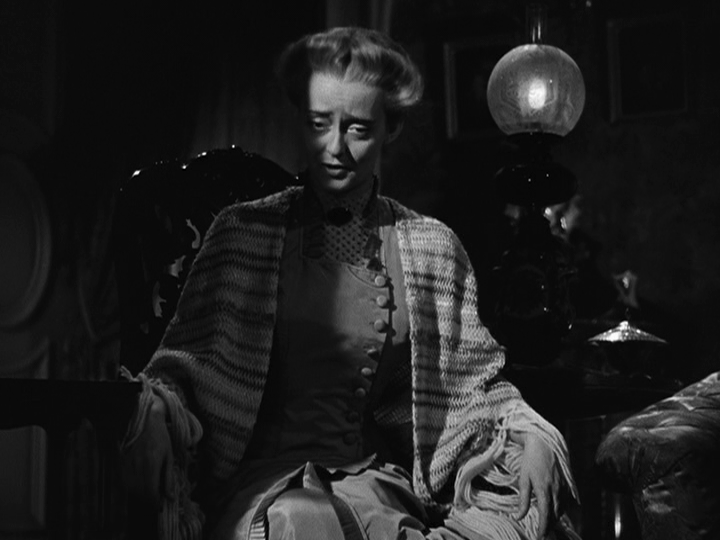 Peary adds that “you’ll smile watching the two females resolve their problems”; and it’s true that the “final few scenes — for which you should have your hankies handy”, are touching. However, this dated “suffering mama” story — based on a novella by Edith Wharton, which was turned into a Pulitzer Prize-winning play by Zoe Akins — is only must-see for fans of Davis and/or Hopkins (whose performance is refreshingly restrained). No, but it’s worth a look. 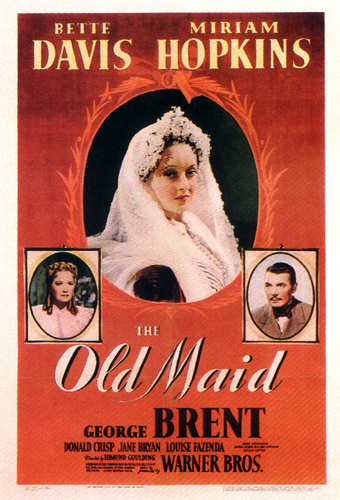 ‘The Old Maid’ (1939) [streaming on FilmStruck]: Oh, the dark shadow of propriety! …which is what makes this film dated. It holds that element of ‘the child out-of-wedlock’… which, nowadays, is a non-issue. I thought I had seen this film before, but it turns out I hadn’t. In it… Miriam Hopkins grows tired of endlessly waiting for the man who has promised to return to her. On the day he (George Brent) *does* return, she is about to marry someone else. ~which, of course, leaves Bette Davis (who has secretly loved Brent for years) free to declare her love… and, of course. bear an illegitimate child. This is all wholesale soap opera, from start to finish – but the complications are played to an engaging hilt and Edmund Goulding’s direction is right on the money. He even has the stamina to tell Hopkins to ‘Please, rein it in, honey!’, so she’s not nearly as ‘Me, me, me’ as she can be elsewhere. As a result, she and Davis are rather splendid together (quite something, really – considering how they detested each other). The film works for us now mostly as a potent example of the terror of white privilege – how you *had* to do what ‘proper white people’ in society did… or suffer the consequences. (And, oh, how we continue to live with that today… in its different forms.) This classic comes with pedigree: novel by Edith Wharton, turned into a Pulitzer-winning play by Zoe Akins and adapted by dependable Casey Robinson. Orry-Kelly has a field day throughout four wedding sequences. 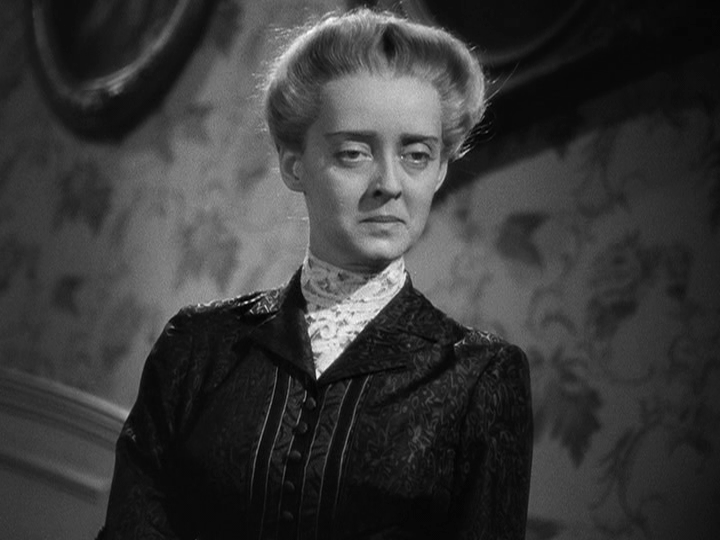 Davis gets to suffer admirably, basically turning into Gladys Cooper in ‘Now, Voyager’ in the process. The final scenes build beautifully – and that last one aims right at our hearts!